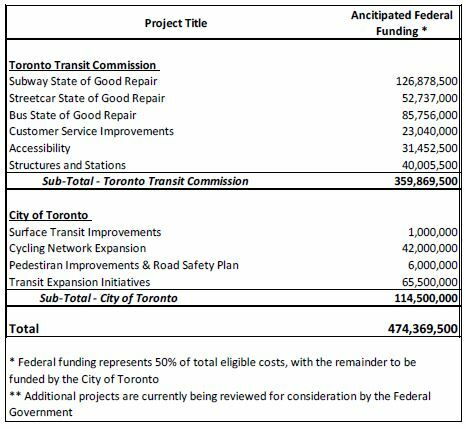 This report provides a detailed description of the funding from the first phase of the new Federal money including descriptions of each of the projects at the TTC and City (see Appendix A). Other than these details, little is new here since I reported on the PTIF a week ago. Toronto will receive $474 million of which $360m goes to TTC projects and the remainder to the City. As my previous article detailed, many of the individual projects within the list already had committed funding from the City, and reducing their contribution level to 50% will free up money for other projects that were not funded. The exact details of this have not yet appeared as the City’s budget papers are not yet public. In the TTC budget, it is simply assumed that there will be a 50-50 split for all items. Some work cannot be completed within the budget year where it was planned either because it is more complex than expected, or because of conflicts or co-ordination with other work. Some work actually comes in under budget, although this may be offset by over budget spending in other projects. Procurement processes may encounter difficulties that prevent work from being undertaken including the ability of contractors to start when expected. While work continues to improve our capacity-to-spend, it is recognized that the trend is persistent and that it affords an opportunity to reallocate funding to priorities that could not otherwise be advanced due to the gap in capital funding. The important word here is “slippage”. This describes a situation where current year work or procurement slips into future years thereby reducing the capital spending required “this year”. The need to spend does not vanish, it just moves to another year’s budget. Probably the most dramatic example of this is the late delivery of the new Flexity streetcars where the originally projected cash flows for the procurement are wildly out of line with actual spending. Even for 2016, the amount to be spent will be considerably lower because deliveries are running behind the rate on which the budget was planned. On this basis, the TTC plans to reduce its projected spending across the board in future years. … staff proposes a budget reduction target across Staff Report on all fully funded programs (excluding revenue buses) of 15% in 2017 through 2020 and a reduced target of 10% from 2021 to 2026. The TTC, together with City Staff, has been reviewing the problem with spending shortfalls, and lists several “root causes”. • Cause: Limited maintenance window prevents sufficient access to subway right-of-way to perform the required routine and corrective maintenance. Corrective action planned/taken: Continuous re-evaluation of planned work to maximize effectiveness during the maintenance window. Re-opening Keele Yard would allow for faster deployment of crews to the worksite. A yard in the west end of the city would provide a similar advantage. A longer maintenance window is to be investigated to allow for more work to be performed. Corrective action planned/taken: TTC is in the process of establishing an Enterprise Asset Manager. The mandate will be to create an enterprise wide asset inventory, asset condition assessment, asset life cycle management plan and a consolidated long-term capital asset management plan. Corrective action planned/taken: Improved resource planning and expedited recruitment processes. Where necessary, budget requests for additional capital headcount. • Cause: Increased due diligence during the procurement of orders above $100k has resulted in longer bidding processes. Corrective action planned/taken: The procurement process is being re-evaluated to ensure the quickest possible turnaround while maintaining due diligence. • Cause: Inconsistent performance of vendors and/or business partners resulting in deferred expenditures. This is all very well, but the “causes” given here affect the timing of expenditures, not the amount to be spent. One could very well expect that the budget for, say, 2017, would not all be spent by year-end, but jumping to the conclusion that the excess would never be required is quite another matter. The effect of this change is to remove $850 million, roughly one third, from the unfunded backlog of TTC capital projects. However, actually achieving this requires one key assumption – that what is called “slippage” above is really spending that would never actually occur. That is a major shift for the TTC, and it puts the capital “shortfall” in a very different light. One might well ask how major subway projects such as the TYSSE (Spadina extension) which went well over budget, and the SSE (Scarborough extension) whose cost grows with every new report, magically are immune from this consideration when much of the “base program” is not. Either the TTC has consistently overestimated the money it needs for the Capital Plan, or the accounting change will strip money from projects that otherwise would be needed as contingency against unexpected costs. One might argue that this “contingency” is really “gravy” that should never have been in the budget. Conversely, if the money is needed, then this is simply an arbitrary reduction to make the budgetary problem vanish for a time. Either way, this does not say much for the TTC’s financial planning. 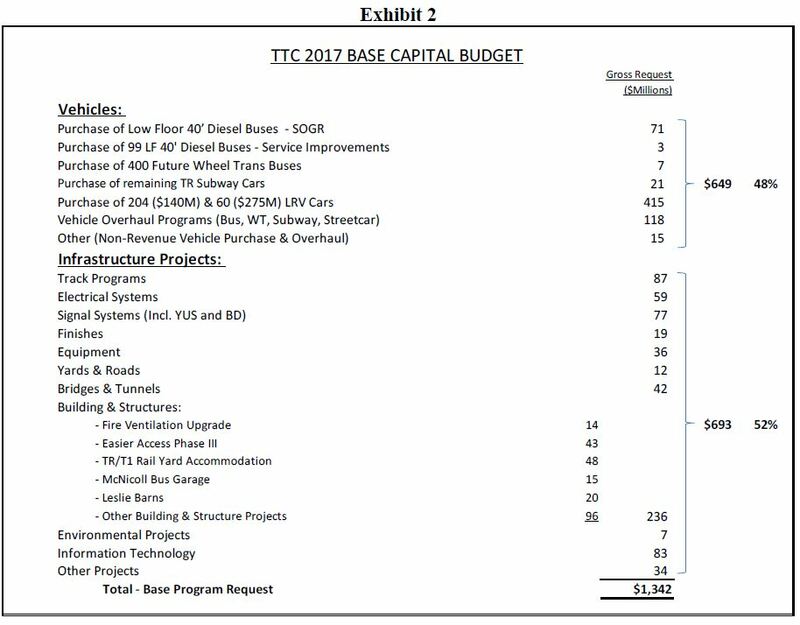 The ten year Capital Budget has a “Base Program” that supports major infrastructure renewal projects, vehicle replacement and fleet expansion. The TYSSE and SSE projects have separate budgets with their own dedicated funding streams. The total spending planned for the decade has grown from 2014 at $9 billion to $9.4b in the 2017 budget. For several years, the known funding sources (federal and provincial subsidy, local borrowing and capital-from-current spending) have fallen well short by an amount that grew from $2.5b to $3.1b in the same period. As the table above shows, this amount is now claimed to be cut by two thirds to “only” $1 billion, although this does not take into account many proposed projects that are not even part of the “approved base budget”. Looking at the funding in more detail shows how the various sources contribute to the overall program and how these change over time. Unlike the summary table, this version does not include the “phase 2” federal PTIF funds and so the shortfall is greater than shown in the summary above. Provincial gas tax contributes $75m annually to the capital programs. The remaining roughly $90m from this source goes to the Operating Budget and is not included here. Spending on Metrolinx projects such as the Eglinton Crosstown does not appear in the TTC’s financial plans, but features prominently whenever Queen’s Park talks about how much money comes from Ontario to Toronto. Similarly, spending on the TYSSE and SSE by other governments show up in their budgets, not in the TTC’s base program. This illustrates how ongoing renewal of the system has taken a distant second place in spending priorities. The Flexity LRV program is the last substantial line item in the base program with its own provincial funding. The line “LRV LDs” refers to “Liquidated Damages” on the Flexity program and shows the TTC’s anticipated recoveries from Bombardier. Developent Charges are set by the City of Toronto under a provincially mandated formula. Only the proportion of capital spending that can be linked to serving new developments requiring system expansion can be recovered through DCs. City Debt represents borrowing by Toronto within its self-imposed limit that debt service costs not exceed 15% of property tax revenue. Provincial legislation sets a 25% cap, but Toronto prefers a lower value to leave headroom and to protect its favourable credit rating. The table assumes that the City will provide matching funds to PTIF over and above the money from the debt pool. This is only possible if the City finds a new revenue stream. The amount of money involved is larger than shown here because this table does not include PTIF phase 2. In the short term, funding is available from sale (“monetization”) of city assets. However, combined with the drop in borrowing, the total City funding falls precipitously in the 2020s. In 2017, the budget has an embarrassment of riches, a “surplus” of $575 million. A goodly chunk of this is due to the timing of City Debt, and it would not be surprising to find Toronto redirecting its borrowing capacity elsewhere in the overall City capital budget. However, the ten year shortfall of $1.754 billion (or about $1b when the phase 2 PTIF funding is considered), depends on this 2017 “surplus”. In theory, some work now planned for future years could be brought forward into the 2017-18 timeframe. However, this is not always the simplest thing to do because of project lead times, and because some spending is based on the years when various subsystems and infrastructure are due for replacement or major overhaul. 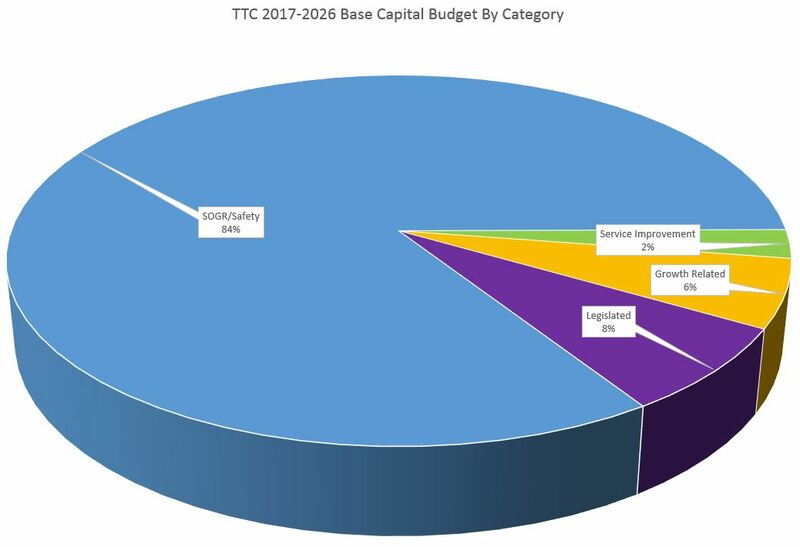 Whether Toronto will leave the borrowing capacity and reserve funds for transit use into the 2020s when they are actually needed is a challenging question because Toronto Council is not known to avoid spending whenever loose change appears. This could make the capital funding shortfall rise again undoing the benefit of the federal PTIF program. B: The 2016 budget value for the item. For new items, this value is zero. P: The proposed 2017 budget value. C: The change from 2016 to 2017. Scattered through this appendix are entries for “City Requested Budget Reduction”, and these are summarized at the end of the budget. These are adjusting values that brought the 2016 budget within the then-available funding. In 2017, there are reversing entries to zero out all of these reductions. Some of these reductions could reappear depending on how much of the shortfall remains at the end of this year’s budget process. The base budget for 2017 is large by historical standards at $1.342 billion. The figures shown below are only for the 2017 budget year, not for the life of each project. The beginning of a program to replace the Wheel Trans bus fleet. Considering that for some years the TTC has been attempting to shift as many WT riders as possible out of a dedicated fleet to taxis and to the “conventional” system, this signals an acceptance than the WT bus operations are here to stay. The 60 additional LRV cars have moved back “above the line” because the TTC acknowledges the need for a larger fleet to handle continued growth in demand on the streetcar lines. Included in the “vehicle overhaul programs” are projects to renew 30 ALRVs (an existing project) and 30 CLRVs (net new) to tide the system over pending expansion of the Flexity fleet. In the publicity surrounding the PTIF announcement, there were suggestions that the installation of elevators in subway stations (the largest part of the “Easier Access Phase III” program listed above) could be accelerated. This project shows up in the detailed budget on page 22 where spending in 2017 is actually less than planned in the 2016 budget, but it then ramps up substantially in 2019 and following years. The total project budget over ten years rises by about 30% (from $394m to $513m), with the largest increases in the “out” years. This does not appear to be as much an “acceleration” of the work as a major rethink of the cost of completing the project. Among the changes in planned future spending is an increase of $125 million for bus purchases. This reflects a reduction in the planned lifespan of the fleet from 18 to 15 years. Not shown is any offsetting reduction in future bus maintenance costs because this will not appear until after the ten year budget window, although there should be savings in reduced scope of rebuilds for the existing fleet. Until a detailed fleet plan is available, it is difficult to comment further because each group of vehicles has its own life cycle cost profile. Within the budget, 84% of the expenditures are categorized as “State of Good Repair/Safety”. This is generally a valid presentation although there are some anomalies within the budget. For example, the McNicoll Garage is classed as part of “Growth”, but making room to accommodate the growing subway car fleet is “State of Good Repair”. The real problem here is that the categorization was originally intended to allow for priorities with “SOGR” topping the list. However, when most of the budget falls into one category, everything is “priority 1”, and budget trims nibble around the edges. “SOGR” is a valid classification, but the fact that major projects like the TYSSE and SSE are in their own budgets skews the relative proportions of spending as presented in the base budget. The relative size of these budgets is evident in the charts below. First is the base budget, followed by the base plus the two major expansion projects. Note that spending on the TYSSE is relatively small because this project is nearly complete and most of the expense lies in past years. However, many other projects are “below below the line” in the sense that they are not just unfunded, they are not even part of the “approved” program. These include new transit service in the Waterfront, and several possible capacity expansion projects on the subway system such as station expansions and a new subway yard to accommodate the growing fleet. New lines such as the Relief Line and the Richmond Hill extension also fall into this category. Some of these projects may attract specific funding from other governments, but there is no guarantee that this will not crowd out needed spending on “routine” maintenance and capacity-related improvements to the existing system. 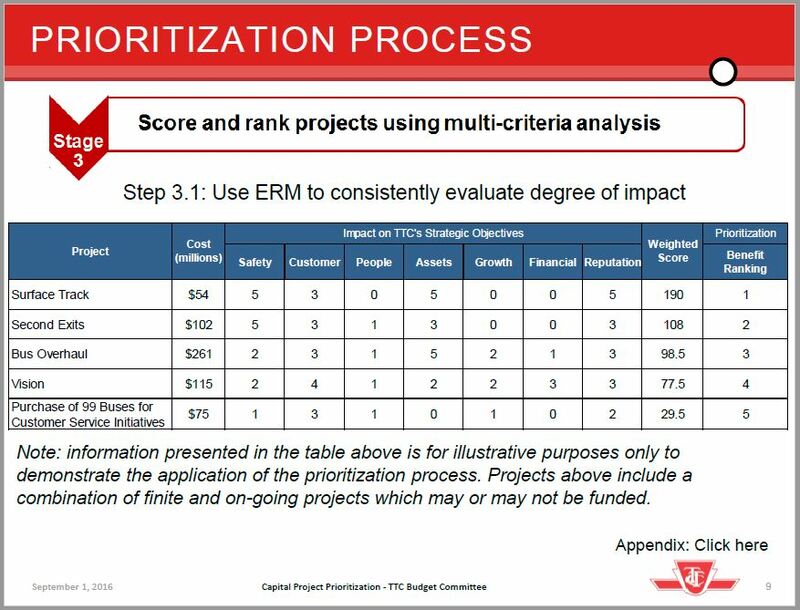 When the unfunded project list was quite long, the TTC’s Budget Committee asked management to come up with a process for prioritizing spending. There is a long report and presentation which talks about business cases, risk management and other factors that would go into this process. A sample is given to show what this might look like. This is only an example and does not necessarily reflect what the real process would involve. The ranking of buses for Customer Service Initiatives is particularly amusing, and I hope this is not representative of the TTC’s outlook on the importance of actually providing space for riders. Some projects are ongoing maintenance such as bus overhauls, and they occur at defined times in the life of an asset such as a bus, escalator, subway car or track. Their priority arises from the need to do this type of work on a regular basis and avoid a buildup of deferred work that triggers in service failures. The dollar values shown here for some projects are only for a few year’s expenditure, and the process needs to recognize the difference between a one-year and a ten-year spending window. Some projects are “finite” in the sense that once completed, they do not recur. The “Vision” project shown above is the new name for the TTC’s replacement of its surface vehicle monitoring and management system. When the list of projects becomes longer, priorities will get muddier in the sense that many of them are likely to clump together with similar rankings. All of this methodology is a “nice to have”, but it misses a basic point: the list of unfunded projects is now much smaller than in past years, and so there is much less to “prioritize”. In particular, once a project achieves “funded, approved” status, it does not appear that it would (or in many cases could) participate in prioritization. Moreover, we could see the same effect as with the large proportion “SOGR” has in the base capital budget: everything scores well and nothing is expendable. The original report included a presentation deck with an intriguing “Next Steps” slide that talked about incorporating “feedback from June Budget Committee meeting”. As anyone who follows TTC affairs will know, there was no June Budget Committee meeting. Indeed, the last such meeting took place (officially) in November 2015. The TTC has confirmed that this presentation was written for the cancelled June meeting, but will now be updated. Could a preliminary set of priorities have been available now if only the Committee had deigned to actually meet and approve this process? 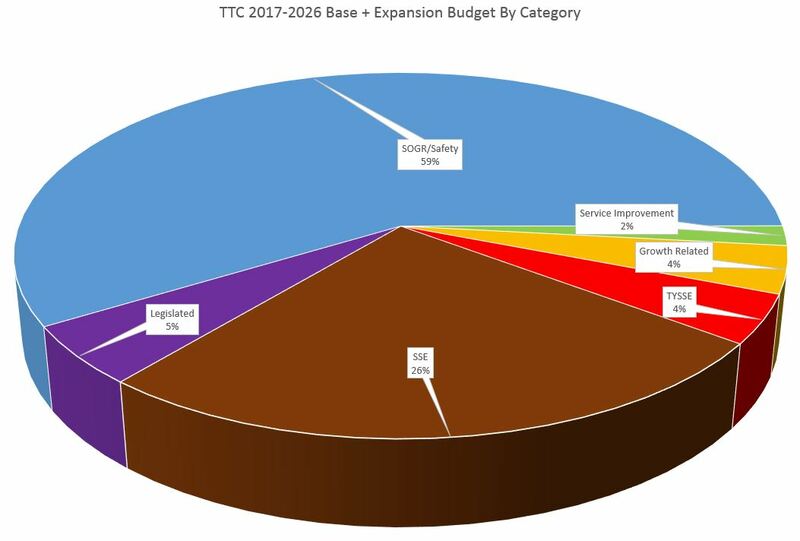 TTC budgets are among the largest in Toronto outside of the City government itself, and funding the TTC is among the most troublesome challenges facing Council. These budgets require attention to follow the details and make informed decisions about policy recommendations. Sadly, the TTC Board seems uninterested in this most fundamental of its duties. 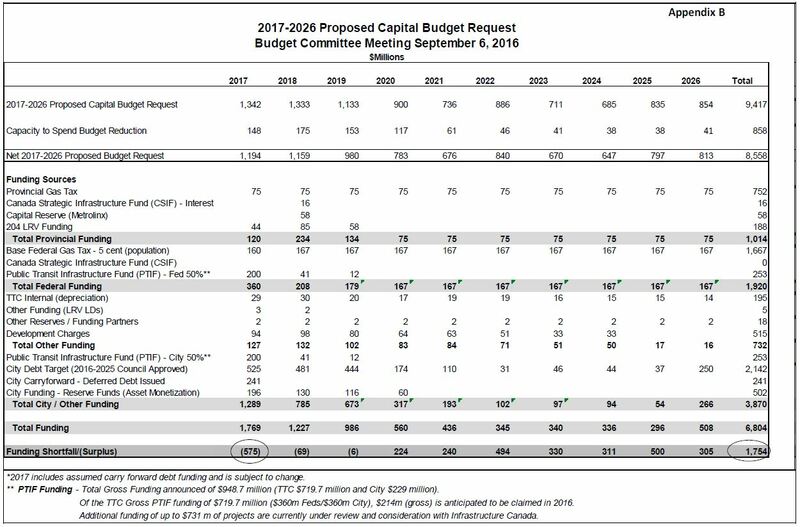 The following table compares the sources of funding shown in last year’s (2016-2025) capital budget to the one in this year’s (2017-2026, also included above inline). There is a small increase in the projected Provincial gas tax. The timing of Provincial payments toward the 204 car LRV order has been adjusted. Phase 1 of the PTIF has been added to both the Federal and City contributions. The value for depreciation and for development charges have been adjusted based on current projections. The City debt targets have been adjusted with a small increase in most years. This chart will change substantially once the PTIF phase 2 values are added, but all of the PTIF spending assumes net new funding for the City’s 50% share. This section will be added after I have done a line-by-line review of the budget to see how it has changed from the 2016 version. My takeaway is that the TTC’s capital budget process is murky and messy enough to make it very hard to get firm numbers and firm priorities. This plays into the hands of the gravy train contingent on City Council who can easily tear apart the TTC’s capital budget and not fund stuff that likely should be funded were the budget clear and emphatic enough. Which prompts the question, does the TTC really believe in all the capital projects above and below the line and sometimes lurking off the edge of the sheet? Or is this kabuki theatre, where the capital budget the TTC presents not really the capital budget the TTC (wants/thinks it needs: select one) — and the inevitable Council cuts are part of the pre-determined script? Steve: Council tends not to get into the weeds of the capital budget because it’s just too complex. However, if the TTC manages to make almost a billion dollars appear out of thin air by making cuts in estimates, it undermines their credibility — in effect a whole boatload of gravy has just been scuttled. @ Ed – It is complex by design so that items that should NOT be funded get overlooked and funded by our layman Council. Given the complexities of budgets, having a law or mathematics degree should be a requirement for every councillor, MPP, and MP. That would also keep the likes of Rob and Doug Ford away though John Tory would still qualify. As it stands, there are virtually no requirements to run for public office. There should at least be a university degree required in addition to a criminal record check and as it stands, many convicted criminals have been elected and re-elected all across Canada. Steve: It is not the convicted criminals we have to worry about, but those who feel they are immune to criticism because of their exalted public role. Neither of those degrees will help someone with budgeting, particularly the under the unique government accounting standards. Municipal budgeting has its own rules and regulations that would never fly in the private sector. Most Chartered Accountants would be perplexed by how it all works and why it is allowed to happen as it does. Provincial budgeting is even more opaque and riddled with “tools” that shuffle and hide expenses and bring forward revenues. In some ways it’s more gambling than budgeting. Executives of publicly traded businesses would go to jail for using the accounting methods of our governments. article, the TTC is either not competent enough to spend all the money allocated to it or has been allocated way more money than it needs. Steve: Actually, the TTC is juggling its books to reduce the amount of money Tory has to find. 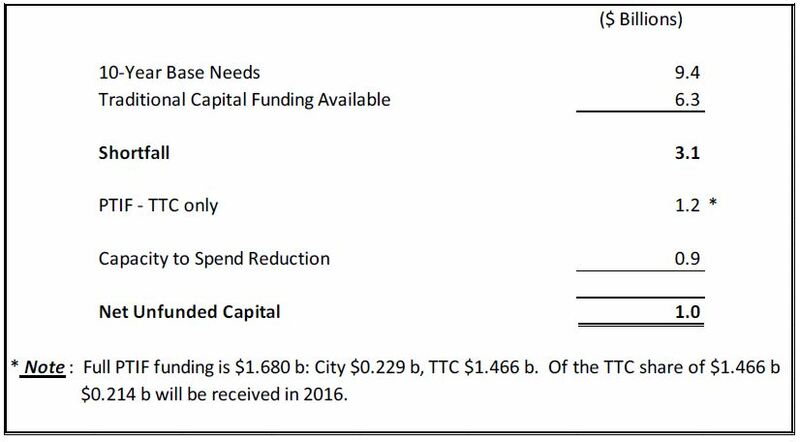 The TTC presents the reduction in its capital requirements as a “Capacity to Spend” issue, but confuses the annual carry-over of unspent funding (from incomplete projects) with the actual execution of the projects. This can be done (and is done regularly) on a one-year basis, but not cumulatively. If we believe the TTC, they are saying that although for years they have a $9 billion capital program, it’s really $8 billion. To make that work they will have to actually find the difference, line by line, in their budget, and that will be quite a challenge. Jonathan: Executives of publicly traded businesses would go to jail for using the accounting methods of our governments. Why is it legal what the TTC brass are doing? Steve: Because they are not offering shares for sale. @Jordan @Steve: How about an IQ test for politicians if not a university degree? Would that have kept Rob and Thug Ford out? Steve: Probably not considering some others who are on Council like Mammo. The bar is set very low. Also, I don’t think that DoFo is stupid. I may not agree with his politics or his tactics, but the last thing we should do is to underestimate him. Publicly-traded companies have to present a legally correct accounting statement. I think that’s at any mandated financial reporting interval (quarterly seems typical). I am not sure there are any legal accounting standards for preparing future budgets. Accountants can’t count plans; or at least there’s no GAAP for proposed future budget expenditures that I know of. The accountant can determine that the TTC spent $X in the current fiscal reporting period, and should be able to break it down to the penny. Neither the accountant nor accounting rules can have much to say if tunnel repairs are moved to six years in the future from four, while purchase of new buses is accelerated.